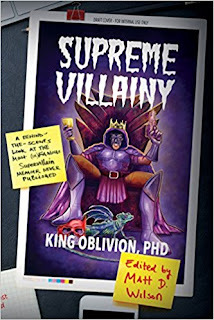 Supreme Villainy is the third in a series of supervillain-themed books by Matt D. Wilson. The first two were manuals for supervillainy, which I have not read; this is a memoir of "King Oblivion, Ph.D.", who is an analog to Doctor Doom, if Doom's mentor were Dr. Cockroach from Monsters v. Aliens and if Doom's nemesis was Superman. It didn't really work for me, mostly because the jokes didn't surprise me. I've read or watched a lot of superhero deconstruction and metafiction and there wasn't a lot new here, you know? For instance, the various chapters were ghost-written by authors KOPhD had kidnapped; one of them was Stephanie Rex, or something equally transparent. So there was a certain amount of diversion in matching supposed ghost-writer to pastiched style. But I didn't recognize the names of all of the writers (and didn't care enough to research) and the pastiches weren't that admirably executed. I will give credit for the name of KO's consigliere, Miss Spiraci, which I did not grok until well after finishing the book. Her name is Connie, you see. The unreliable narrator aspect was also executed well; it was never quite clear whether KO was actually reasonably competent (but possessed of an astronomical ego), or was a pointy-haired boss completely oblivious to their own shortcomings, along the lines of the Monarch, with the consigliere as the Dr. Girlfriend type. So here's what I'm going to say: If you're not the kind of person to have already read Robert Mayer's Superfolks and its cousins and heirs; if you don't know The Tick and Radioactive Man; you will probably get a lot of enjoyment out of this book. It's competently written and I had no trouble finishing it. But if you're like me, this is pretty familiar territory, and I wasn't inclined to laugh a lot at it.